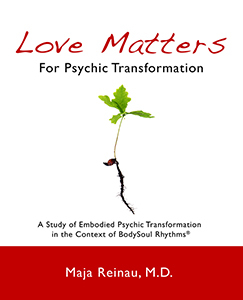 Love Matters for Psychic Transformation skillfully outlines the space-time rhythms of an intensive BSR week. Usually it takes place in a beautiful landscape, which in itself nourishes soul work and activates inner landscapes. It would be beyond the scope of this foreword to describe all the activities of an intensive week, but let me mention a few that strike me as outstanding. Breakfast begins in silence, followed by a ritual dance, the reading of a poem, and a short meditation. The morning ends with a presentation on some specific theme, often connected with Jungian psychology. The afternoon is centered on body and voice work, adding an experiential dimension to what has been already activated through nature, dreams, meditation, or the morning presentation. The focus of the first evening is on providing a positive mothering exercise, the following evenings on the making of masks, and the final evening on an ending ritual. After having described the basic dynamics of BSR, Maja Reinau interviews six women who have completed the BSR training program. With great skill and confidence the author has documented the transformative moments that take place in BSR intensives. As each story unfolds, one feels one is moving with these women in the river of life. One story speaks about a shamed body gaining presence in the loving gaze of like-minded women. Next we learn about a participant who discovers she can explore a different feminine body that is free from the judgments of the brain and a culture that tells women how they should look. Another narrative tells us how the darkest, shut-off parts of a woman’s soul finally could be met through the eyes of another. Through mask-work one woman faces a rigid defense system, learns to trust what happens in the moment, and discovers that her psyche finds nourishment and new life through listening to myth and poetry. In another case we read about a dramatic occurrence of rebirth that brought healing to an original birth trauma. In the final interview we witness an immersion in a common field connecting body, soul, and group members in a holistic experience that stimulates the imagination in a playful, loving way. As Maja Reinau concludes her description of BSR, one has the impression that one has witnessed the essence of women’s mysteries within a modern context. Process, presence, and paradox become the essential ingredients of those mysteries. Each participant has the opportunity of gaining awareness of the creative potential of the psyche, a sense of being truly present to oneself and to the other, and an acceptance of life’s contradictions, especially the realm of the shadow. This salutary brew nourishes the soul when stirred under the auspices of an archetypal feminine triad: the mother, the virgin, and the crone, symbolizing loving containment, pregnant creativity, and the wisdom of age. For Maja Reinau, love is the final transformative factor that brings healing and renewal. This kind of loving is a highly differentiated blend of mirroring, containing, empathic attunement, and resonating with the life energy of all who undertake this daring journey. As one peruses the pages of this book, one cannot but feel the inspiring presence of Marion Woodman, Ann Skinner, and Mary Hamilton. Maja Reinau’s book pays ample tribute to their pioneering endeavor in bringing hope and renewal to the lives of all who have undergone a BSR experience.